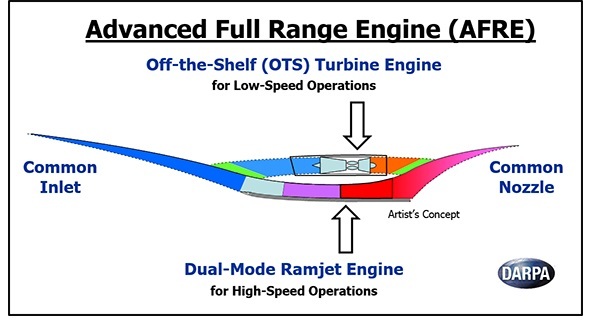 DARPA has awarded a contract worth $21.4 million to Orbital ATK for a research project under the Advanced Full Range Engine (AFRE) program. The defense agency is allocating $1 million in R&D funds for the program in fiscal year 2017, which ends on Sept. 30. “AFRE seeks to develop and demonstrate a new aircraft propulsion system that could operate over the full range of speeds required from low-speed takeoff through hypersonic flight,” DARPA said in a press release announcing the program. Hypersonic speeds are defined as Mach 5 (approximately 3,300 miles per hour/5,300 kilometers per hour) and above. Surprised this is going to OATK, and not somebody like GE, P/W, or even rocketdyne. Does OATK have experience with engines? What’s new here?? This concept has been around for a zillion years. Materials? Structures? If the thing is operating in ram/scram mode, it’s carrying around a lot of dead weight in subsonic engine stuff and in subsonic mode the reverse is true. Then again, the air inlet system and its mechanisms have to operate in a truly rotten environment for both ascent and entry. And then you’ll have to supply rockets and the oxygen for the remaining 80% of the deltaV needed to get to orbit. Because after decades of fiddling around with scram/ramjets no one has gotten one to fly on a regular basis. Not even the military which loves things that go fast and has money to burn. The trick here is coming up with a method to swap the air paths. Len Cormier was messing around with something like this but, the transition between modes was unsettling. the idea is the thrust is high enough, to still achieve the mission goals. It’s a hard problem though. It’s definitely DARPA hard. O-ATK includes GASL the scramjet group.